Your Beauty Industry: Do your research! Do you research what’s going on in your industry regularly? You should do. Whatever sector of the beauty industry you work in, you will always be better at what you do if you understand your industry from all angles. And – importantly – if you not only keep up with what is happening in the industry but also regularly research emerging trends and technologies, you can make sure you are always a step ahead of your competitors. Don’t look at what everyone else is doing and do the same – think about how you think these trends will develop and create your own route. Create your own trends. Look at trends in other industries and bring them to beauty. Immerse yourself in the people that are imperative to the job that you do – be it consumers, journalists, bloggers or whoever, so you can get a deep understanding of what they want, instead of offering them what you think they want, or offering them what everyone else is already offering. It can be difficult to find the time to research, as our days are already full to the brim with our daily work demands. 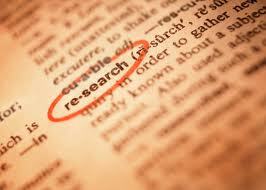 But set yourself some time aside each day to research and you will soon see the direct impact it has on your work. I am signed up to a ton of blogs, vlogs and newsletters and I follow some fantastic people and brands on Twitter which regularly tweet interesting news links. When you come across an interesting piece or a writer/blogger you particularly admire, check to see if there is a newsletter/blog that you can sign up to so that future news is sent straight to your inbox or your RSS feed, instead of you having to remember to hunt the same websites out time and again. I find myself feeling guilty when I do my daily research – especially because I enjoy it so much! I feel like I should be dedicating every minute of the day to work I am getting paid for. But my research only enhances the work I do for my clients – it inspires me with creative ideas, gives me a sound knowledge of the industry and enables me to help them stay one step ahead of the game. I will be sharing some of my favourite links with you in future posts on my blog, to help inspire and inform you. You can also check out my Recommended Reads and Useful Links on the left hand menu bar of this blog. If anyone has any articles, news pieces, blog posts or anything you would like to share with other people in the beauty industry, please leave the link in the comment box below, or email them to me at yourbeautyindustry@gmail.com, and I will share them with my readers (and credit you). Share the love!